This summer, we tried out a new program that was really fun and easy: Lunch Bunch at the Library! Our Lunch Bunch met every weekday for one week during the summer. We met from 12:30-1:00pm and invited families to bring a sack lunch to the library and listen to a chapter book readaloud while they ate. Disclaimer: This is where I tell you that attendance was really low for this program. The highest I had all week was five children and two adults. I did have one day where I only had one child. This is not really a sustainable number for us, but it was so easy and fun that I want to try it at least once more and see if we can't grow the program a little bit. AND I will say that even though the numbers were low, the kids who did attend LOVED the program. I had three very loyal kids who came every day they could to hear as much of the story as possible. Here's how I prepared for Lunch Bunch. I picked out a chapter book to read aloud. I wanted something that would appeal to our lower elementary age group and that I could easily read in five 30ish-minute sessions. I chose the book Toys Go Out by Emily Jenkins, which turned out to be a really fun read. A couple of weeks before the program started, I actually read this book out loud in my office, noting about how long it took me to read each chapter. This helped me plot out how much I would plan to read each day and it helped me develop the voices that I would use as I read, so I could try to keep them consistent. I set up the room with tables facing the front of the room so that families could sit at the tables to eat their lunches. I had space on the carpet for any that didn't bring a lunch and I invited the kids to come sit on the carpet when they had finished their lunch. I kept the lights down a little bit, which made a really relaxing atmosphere (at least for this librarian!). This was my little oasis during this hectic summer week. I pulled a selection of readalikes and several copies of Toys Go Out to put on a display in the room. If families couldn't come every day, they were welcome to check out a copy of the book to keep reading at home. Reading a chapter book aloud is a different animal than reading picture books aloud, and it's really fun. This was a program I honestly looked forward to every day, made even better when my small crowd became loyal listeners. This was a program that was fun for kids and librarian alike. 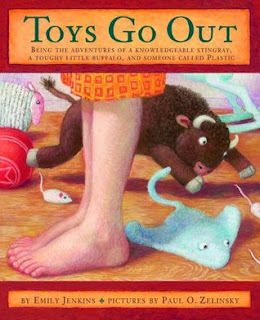 What I did not super realize when I picked Toys Go Out was that the chapters are very episodic, making it easy for families to drop in and understand the story even if they hadn't come every day. This was nice, but not totally necessary. The kids did a great job of remembering what we had read about the day before and I asked them questions at the beginning of the program to refresh their memory. I found that the chapters took longer to read with the kids than they had when I was alone because I would pause every so often and ask the kids questions to keep them attentive and make sure they understood what was going on in the story. I also took about 5-10 minutes at the beginning of our programs to allow the kids to get their lunches ready and refresh them on what we had read the previous day. Before I even started, I wondered how this program would go. I thought that if attendance was low, I might try a different format next time: reading the beginning of a different chapter book each day and then providing copies for children to check out. I still may try this format (I think it would especially work as a once-a-week program), but it was really a great experience to read one entire book with these kids. Maybe I will try one book over a week's time again during our school breaks, and next summer try out a weekly program reading the beginnings of different chapter books. Although I thought that having an episodic novel would encourage more listeners to pop in throughout the week, it didn't really work out that way. I wouldn't especially look for an episodic book next time. I also wouldn't worry as much about finishing the book within a certain span of days. It's certainly nice to read the entire book from start to finish, but if I'm able to provide copies for check out, that might even encourage families to read together at home to find out the ending. What I love about this program, too, is that it introduces families to chapter books that make good family readalouds and it emphasizes the importance of reading aloud to kids of all ages. This might also make a great (easy!) program to take on the road. We may consider offering it to daycares and summer camps (although I guess the concern there would be that we would potentially have ALL the kids, not just the kids who would elect to sit and listen to a book, so I wonder if we'd have behavior issues). I'm glad that we tried it out. It was a good experience. And I will try it again to see if we can get attendance up. Comic Book Workshop: Guest Post from Ms. Teresa!